Our professionally guided buggy and quad bike safari runs daily and lasts for 3 hours each time. We will pick you up from your hotel free of charge at either 10:00 a.m. or 3:00 p.m.
Refreshments are included for free and if the machine you choose sits more than one then you take your passenger for free too! There are two trail options. Choose between heading for the Cape Grecko National Park where the scenery is simply breathtaking and you can view Ayia Napa from a high vantage point or you can take the route through the red villages where you will witness locals going about their daily business and gain an appreciation of the true historical value of the area. Either way there are beautiful and interesting things to see and you are assured an impression will be made! 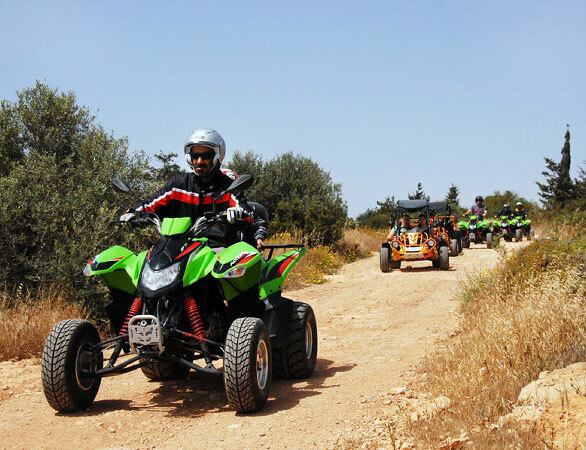 Motorent S.Louka on Nissi Avenue, home of the Extreme buggy and quad bike safari! Home of the Ayia Napa Quad Safari Extreme and of the best deals on rental bikes and quads in the area.